When building the mobile interface for their existing products, Product Owners are faced with quite a few perplexing questions, especially related to the user experience on mobile. A report from ZDNet says UX is one of the most critical concerns for enterprises looking to develop mobile apps while another study points out that users prefer usability and good user experience over brand names. • Who are your real users and what do these real users care about? • How do they actually interact with your existing product? • How will users interact with a new version or new feature? While there are several UX design best practices from the desktop world that can be brought to mobile, this piece focuses on mobile specific issues. The foremost thing to remember when building a mobile interface for your product is that while mobile UX design has similarities with web and software design, simply stripping down your desktop or web experience is not going to do it. While drilling down is fine on the Web, mobile users tend to act more linearly a mobile application. To design a good app, you need to start from grounds up, identifying the customer experience you want, and enhancing it with the right features of your existing product. Great mobile apps are uniquely mobile, they couldn’t be done the same way anywhere else. When choosing whether to design for brand or device, put your preference on device. Your users have been using the device much before they start using your application. Developing custom interfaces will confuse users, slow down adoption, and put a significant obstacle in the way of engagement. Instead, take the principles of the OS-native interface kit, and subtly style your interface elements without altering the underlying functions. A classic example is the Password Engine iPhone app. iPhone users are used to certain ways to access settings or placement of the Back button. By not following them, the app increases the learning curve for users. Mobile apps will always be subjected to interruption, whether by an incoming call or the user’s station arriving. Design your applications such that it is easy for users to pick up from where they left off – save states, break larger tasks down into smaller chunks, and put context throughout. Usually users on mobile will on the move, and hence subjected to lots of distractions. Organize content in a way so that it is easy for consumers to browse through. Take the example of the Gmail iPhone app. All the fields and Call to Action (CTA) are vertically aligned on the left side and thus the user’s eye needs to move in one consistent direction. While the iPhone app from eFileCabinet forces the user’s eye to scan all around the screen. It has less CTA’s and hence a lot of the real estate on phone screen that could have been used. Mobile devices generate a lot of information about the user apart from the traditional data generated from a web solution. This includes things like movement, location, sensor data etc. Think about using this data intelligently to pleasantly surprise the user. Customer satisfaction is great but customer delight is even better. Yelp has recently updated its Nearby feature that now offers suggestions based on user’s location, previous Yelp check-ins and reviews, and Yelp friends as well as other data like the time of day and even the weather. This is a great update because it allows Yelp recommendations to be truly contextual. On a cold morning, it can recommend a good coffee shop while on a sunny day it can point to ice-cream parlours near you. And finally, understand the limitations of mobile devices – constrained hardware resources, screen size and network bandwidth. Consuming too much power or designing buttons for cursors rather than fingers and thumb will lead users to delete your application. Prioritize and present core features from other channels that have especial relevance in a mobile environment and enable mobile users to navigate to the most important content and functionality in as few taps or key presses as possible. Observe users using the product. Ideally, you would compare these usability tests to ones done on your prior product. Does the new design achieve the intended goals, such as being more intuitive and driving users towards specific actions? A great resource to start learning about the UX principles for mobile is the iOS Human Interface Guidelines. Another great resource for learning the basics of iOS UX and UI is Tapworthy: Designing Great iPhone Apps: Josh Clark. Android too has a few Design Guidelines, and it is always good to have a look at them when developing apps for Android. The mobile user experience encompasses the user’s perceptions and feelings before, during and after their interaction with your mobile presence. Creating mobile user experiences that delights a user forces us to rethink a lot of what we have taken for granted so far with desktop design. Mobile user experience is still a developing field, and opportunities for improvement continue to emerge. But dissecting the mobile user experience into its key components, and placing the user’s expectations at the centre, gives us a conceptual framework for building and evaluating good mobile experiences. While Aesthetics play a big role in the immediate impression might be very important as a “buying” feature, often it will fail as a “using” feature if not done in the mental model for a given customer context or usage scenario. User adaptability is surprisingly high when it comes to dealing with inefficiencies. A good Product Manager and User Experience Designer will uncover those inherent inefficiencies and create opportunities to simplify things, bringing the “aha” moment with less capabilities! User Experience (UX) is lot more than User Interface Design and User Interface Design is lot more than pretty fonts and cool colors! Here is a typical interlock/flow of how engineering & design teams work together during a development process of product! Previous posts in this series showcased two discount usability engineering methods – ‘Expert Usability Review‘ and ‘Heuristic Evaluation’. Both these methods are ‘expert based’ – i.e. an interface is reviewed by design or usability experts vs. getting feedback from end users – and are used to identify usability issues on an interface. Post 3 introduces lean Usability Testing – A ‘guerrilla’ version of traditional Usability Testing. Before discussing the how’s and why’s of ‘lean’ testing, here are a few basic points to better understand Usability Testing and why it’s important in context to start up’s. Usability Testing (UT) is a research method used to gain insight into product usability. It is a time bound ‘show and tell’ method where a moderator asks representative users to use and/or talk about the product being evaluated, in context to key task scenarios. A basic test typically starts with open ended ‘interview style’ questions, followed by a longer scenario based ‘show and tell’ session and ends with a debriefing session. Usability Testing can be conducted at various points of the product development lifecycle. Although there are several types of usability tests and techniques that can be used, testing can be broadly classified into ‘Formative’ and ‘Summative’ Testing. The objective is to aid iterative design. Formative Testing is typically qualitative in nature and the goal is to find specific pain points and highlight areas of improvement. Summative Testing is done only with designs that are complete or near completion. The objective is usually to judge the design against quantitative metrics (like efficiency or productivity) or against competitive products. Find out more about Usability Testing and how you can plan for and conduct a test, at Usability.gov. Steve Krug’s demo video is also a good starting point to get started with Usability Testing. The UT method is particularly relevant to start ups, where the environment is characteristically ‘inspired’ and ‘driven’ by a shared product vision. In order to pull in the best talent and sustain momentum, start-up leaders ‘sell’ their product to themselves, to their investors and to their employees. While this can energize teams and enhance productivity, it also fuels the ‘Malcovich Bias’. In a high-pressure, super charged start up environment, it is easy to become ‘product / vision focussed’ rather than focussed on the people who are ultimately going to use the product. Usability Testing puts start up teams in touch with their end users and their reactions to the product that is being built. And seeing people struggle with what seemed standard or obvious reinforces the fact that assumptions made about the product or its features may be very different from the way users actually perceive or experience it. That said, traditional Usability Testing can be difficult to incorporate into tight budgets and product timelines. However, several specific elements add to the cost, duration and complexity of testing, and can be substituted with lightweight alternatives that help make ‘Usability Testing’ leaner. Lean Usability Testing is easier to fit in because it is cheaper and can be done more quickly than traditional testing. And more so in context to Agile Software Development – where a key practice is quick and incremental development. For example, did you know that testing in a professional facility can add to the cost, but is usually not a ‘must have’? At a basic level, a test can be conducted very effectively in any room that is quiet and available for use without interruption. However, with good screen sharing and screen recording software, usability testing can be conducted easily and effectively with a remote participant. Besides saving costs related to renting or setting up a formal testing space, remote testing reduces the costs of accessing geographically dispersed target users. Tech Smith’s Camtasia Recorder is an easy-to-use tool that can be used to capture remote testing sessions for later reference and analysis. Guerrilla Testing: This is an impromptu method and therefore should not be tightly scripted or planned. The distinguishing characteristic of this method is its spontaneity. Besides cost and time saving, Remote Testing and Guerrilla Testing are good DIY research options for start-ups who want to get end user feedback. They are easier to plan and organize than traditional usability tests. Several of the challenges related to scheduling and set up in traditional testing are no longer applicable here. In this case, the researcher pre-recruits participants, and then schedules and conducts tests in the context they would typically use the product – rather than having participants come in to a formal testing venue.Testing in the participants natural context of product usage not only cuts costs associated with a formal facility, but adds richness to the test. Contextual influencers that would otherwise be invisible to the researcher now become added inputs to the research. Post 4 will discuss multiple additional ways in which start up’s can conduct a Usability Test at leaner costs and timelines. We would love to hear about your experience / answer any questions that you have about the research and usability methods you use. We invite members of the start-up community to volunteer their screens / functions for use as examples in upcoming posts showcasing additional research techniques. Email me at devika(at)anagramresearch.com to check whether your screen is eligible for selection. Every product that you build has to be used by people. This is irrespective of “who may pay for the product“. This is an often brought up topic of “User vs Customer“. And if the product is used only by machines and not by real people, then it’s perhaps best to call it “technology”. But the core 2 tasks remain: Design UX for your user, Collect Data from your user, both of them aimed to improve their value proposition. This prompts me to call Data & UX as the two ends of the spectrum of building a tech company. It’s very interesting to note that if Data connotes Scale, UX connotes Empathy. To build a successful company, I imagine that one needs both Scale and Empathy and not just one of them. In my last post, I introduced a discount usability engineering method called the ‘Expert Usability Review’ – A method best suited to start-up’s who have access to skilled and experienced usability / design professionals who can conduct a Usability Review. Post 2 introduces a related technique called the ‘Heuristic Evaluation’. Start up’s that don’t have a usability / design team in place, can start focusing on usability and ease of use, using the ‘Heuristic Evaluation’ method – A method with similar goals to the Expert Usability Review, but a relatively easier starting point for novice researchers. In a Heuristic Evaluation (or Heuristic Review), the reviewers identify issues by looking at an interface in context to a pre-decided set of heuristics. Violations to any of the heuristics indicate non-compliance / potential usability issues. ‘Heuristics’ are rules of thumb – Broader than design guidelines, typically available as self-sufficient ‘sets’ (e.g. Nielsen’s 10 Usability Heuristics / Gerhardt-Powals’ cognitive engineering principles) that can be used standalone / along with other sets. The set of heuristics used act as a guideline – making this method more of a check list based audit rather than requiring reviewers to intuitively identify issues by drawing upon a deep knowledge of usability and UI in general. One of the drawbacks of the Heuristic Evaluation method, is that the issues identified are dependent on the list of heuristics used. So if the set of heuristics is too narrow, there is a chance of some issues going unidentified. On the other hand, if the list of heuristics is very large, the review would take a very long time to do. The most popular set of Heuristics are Jakob Nielson’s 10 Heuristics. However, these are broad guidelines – and may be too abstract for a lay person to interpret and apply. The 275 Web Usability Guidelines from User Focus are more literal and therefore much easier to understand for the lay person. Moreover, these guidelines are available in a neat Excel spread sheet format that includes instructions on how to use them and an auto-calculated numeric rating for guidelines compliance. Before critiquing a product, it is important to understand its context and usage. The knowledge transfer must enable a good understanding of the product strategy and goals, target audience, known trouble points, constraints and design centres. The KT must include a walkthrough of all features, screens and task flows that are critical to the product. While this is not necessary for a simple product or a product with a manageable number of screens, in a complex or large product, defining the key task flows and screens to be reviewed is important to keep the review manageable. With some exceptions, the 80 /20 rule is a good way to do this – Attempt to review 20% of the product features that are used 80% of the time. There are plenty of heuristics available online. Keeping n mind the product you plan to review, it is important to decide whether to use a generic set of heuristics (Like Jacob Nielson’s 10 Heuristics / User Focus guidelines) or whether domain specific / niche heuristics would be more effective. In niche or highly targeted products (products for senior citizens, children, disabled users, mobile phone hardware etc.) generic heuristics may be ineffective for unearthing all issues. The reviewers who are going to be using the heuristics, need to be comfortable / familiar with the heuristics in order to interpret and apply them effectively. A common tendency among newbie reviewers is to jump right into fixing the problem / wording the issue as a recommendation. 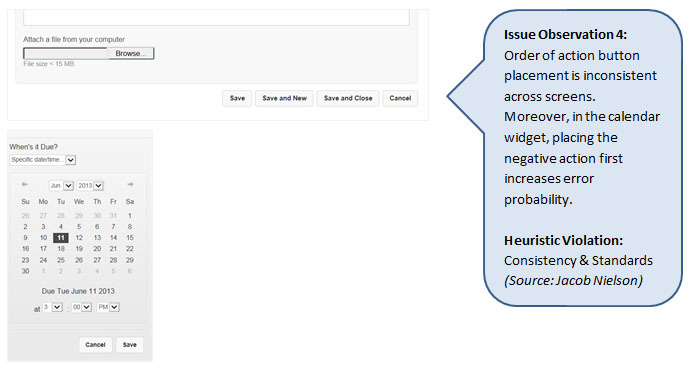 It is important to keep the Heuristic Review focused on issue identification, in context to a given set of heuristics. In fact, an issue may / may not be accompanied by a corresponding recommendation – Issues are sometimes too complex to be tackled by a quick written recommendation and need a larger, more focused redesign effort. Doing this helps focus the post review effort of addressing the issues identified through Heuristic Review. Post 3 coming up soon, will showcase a Guerrilla Research technique – Remote Usability Testing. Look out for this post to learn more about the method and to compare the issues found through Usability Testing, against issues identified through the Expert Usability Review. We invite members of the start-up community to volunteer their screens / functions for use as examples in upcoming posts showcasing additional research techniques. Email me at devika(at)anagramresearch.com to check whether your screen is eligible for selection. Product Manager, or Product Experience Manager? In my last post Experiencing the product, or productizing the experience?, I talked about my experience with SiteZ and how their overall experience left much to be desired even though the core product was good enough. In this post, I will try to analyze things that went wrong which shouldn’t have. They misled the user about the time it takes to register. They didn’t allow the user to abort the registration attempt gracefully (which left the email address behind and created rest of the mess). They were not forthcoming about who is sending me these spam emails (the email address was hidden with a display name that was the advertiser’s). They didn’t give me an easy way to delete my account – emails bounced, UI didn’t have a button to delete, etc. Marketing person would have asked someone in products about whether it can be done in 30 seconds, and someone said yes. Marketing person asked to tweak the flow to make it finish (with basic details) in 30 seconds, but the development team didn’t do the work and instead reused the longer flow. No graceful registration abort – This is purely a feature design or prioritization issue, probably they didn’t think abort is an important use case. Spam mail identity – I think the assumption would be that these mails go out after user has agreed to be spammed, so they would know (this information is anyway mentioned at the bottom of the mail in small fonts. Unsubscribe not working – Again, feature prioritization issue. Not having unsubscribe button is probably illegal in such spams, so the next best thing was to not code the functionality. Can’t delete account – A feature prioritization issue. Account deletion is usually an expensive operation (complicated to implement and get it right, and heavy on processing) and so someone somewhere decided it was not important. A question that comes up: are we talking about one feature, one product, or one experience? Should the feature designer of registration flow worry about spam mail identity? Aren’t these very distinct features? Yes, they are indeed distinct features. At the same time, they need to co-exist peacefully, without causing troubles for each other. SiteZ is one big product, which has multiple features in it which need to plug into each other, and play well with each other. However, if we say SiteZ is a product, it becomes hard to explain #1 above: who should be responsible for advertiser misleading the user. This is the reason why I would like to think of SiteZ as one big experience. Advertising is just augmenting the experience, or in some cases act as the invitation to try the experience. If a restaurant’s brochure misleads the customer and entices him with a 30% discount, which turns out to be only 10%, it is still a problem for the restaurant. So who is responsible for SiteZ product experience? Enter Product Management team (see this discussion thread too). I would like to think it will be Chief Product Officer or VP – Product Management who has ultimate responsibility for the experience. Is it fair to product management team to have such a broad charter? I think it is fair, because the organization needs it and there is no group better positioned to do this. SiteZ had multiple features and services dysfunctional which combined to give a terrible overall experience. Even though they are diverse features and services, in the interest of the customer, overall SiteZ experience needs to be treated as one big product experience. In the next post, we will see how a product management team should have operated so that such issues can be minimized/avoided. Stay tuned!